Savannah State University’s (SSU) homecoming entertainment events are set. The week includes traditional performances, comedy shows and concerts. The residential hall step show, featuring Ayanis, Bri Steves, Recohavoc & K’Ron, is Tuesday, October 23, 8 p.m., Tiger Arena. Tickets are $5. Open to the public. A comedy show and concert with Chico Bean, Karlous Miller, Darren Brand, Lil Baby and Gunna, starts at 7 p.m., Wednesday, October 24, Tiger Arena. Tickets are $50. Open to the public. Join the yardfest on Alexis Circle, noon, Friday, October 26. The official kickoff to homecoming weekend includes a campus parade, fish fry and pep rally. The events are free and open to the public. 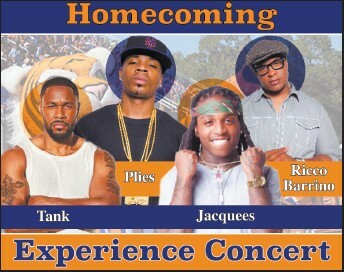 The Homecoming Experience Concert brings Tank, Plies, Jacquees and Ricco Barrino to Tiger Arena, Friday, October 26, 8 p.m. Advanced tickets are $30 for students, $40 general admission or $60 for the floor. Tickets are $5 more at the door. Students can purchase an all access card for $50 from the SSU bookstore until Monday, October 22, which includes all student events (excluding the Homecoming Experience Concert). Tickets for the Homecoming Experience Concert are sold separately at the SSU bookstore.